Back of RR-001-156 during Season V. Courtesy Colin Montgomery. Our Excavation Season V, which began on October 29, 2011, opened with our presentation to Governor Carman Cardinali of our two-volume report on Excavation Season IV. She noted that the Rapa Nui community, especially high school teachers and students, is very enthusiastic and interested in our work. 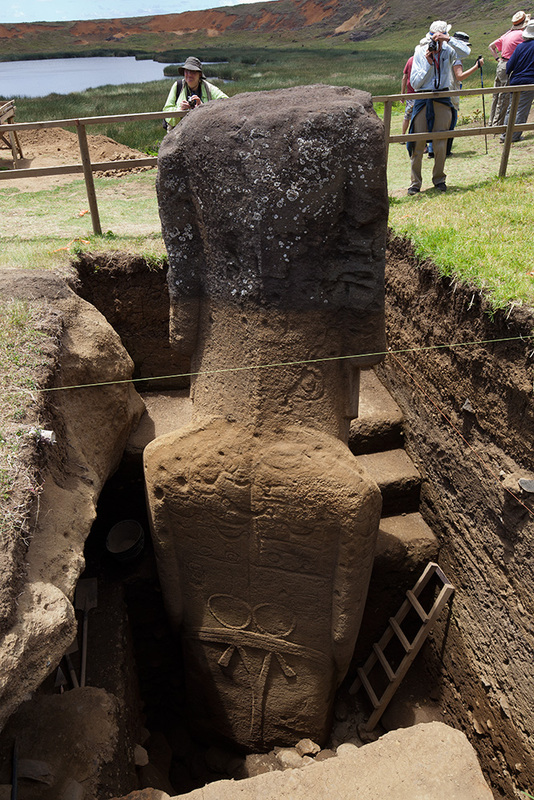 This field season will continue as we carry out further excavation of statue (moai) RR-001-156 in Quarry Two, Rano Raraku. Reports of all work to date are available to the interested reader in the EISP Archives as Excavation Season I, Season II, and Season III or as Conservation Season I and Conservation Season II. Before we began our excavation we visited the basalt quarries and outcrops sampled by our colleague Dr. Christian Fischer as part of our XRF analysis project. We have collected XRF data on over 40 sites. That information will be used byRapa Nui student Rafael Rapu in his comparative study of tools (toki) retrieved in our excavations. Also in May of 2011, Chris Fischer and Mónica Bahamondez, director of the Centro Nacional de Conservación y Restauración (CNCR), treated the excavated portions of both statues with water repellant. On drizzly days or days with intermittent rain we were amazed to see how well the repellant did its job! Droplets quickly beaded up and didn’t penetrate the surfaces of either statue. We noted that the stone surfaces usually dried within a maximum of ten minutes. We are also now engaged in a plan to share our extensive on-site environmental data with colleagues modeling the island’s ecology. Our continued excavation of RR-001-156 revealed more about the ritual concerns of those who frequented Rano Raraku interior quarry over about 500 years. We collected further evidence of red pigment (kie’a), an indispensable part of Rapa Nui ritual life and today a valuable part of personal display during performance art. Interestingly, Rapa Nui oral traditions say that statue carvers were paid for their talent and effort in desirable food, including especially tuna and lobster. At the deepest level of our excavation this season we found tuna vertebrae! Also, we found strong evidence of how the ancient carvers manipulated the statue to raise it upright, pivot it and drop it in a hole 1 m deep cut in bedrock. The process left scars and indents on the statue surface. When seen on statues lying on roads, these same sorts of scars have been interpreted by others as evidence of upright transport methods. Our excavation, however, clearly shows that such damage could have been caused in the quarry. The unpublished notes of the Mana Expedition to Easter Island (1914-15) suggested and support these findings in Quarry 2 and elsewhere in Rano Raraku. Both of our excavated statues, as you know from our previous letters, are intriguing because they are nearly unique on Easter Island. While many statues have individual petroglyphs, these and only one other statue—of over 1,000 we have documented—have multiple petroglyphs carved as a composition on their backs. Underlying these carvings is a complex symbol found on less than 100 statues. It is referred to by previous researchers as the “ring and girdle” design, and sometimes said to represent the “sun and rainbow.” However, statue RR-001-156 and some others have two “rings” above the crescent “girdle.” We have long interpreted this form as the Rapa Nui version of the Polynesian maro or loincloth (maro is also a unit of measurement). As we noted long ago on a statue torso (007) at Ahu Oroi (12-460), the upright “Y” or “M” element below the maro on both of our excavated statues represents two hafted adzes. This depiction, which may be interpreted as evidence of craft specialization in the form of an emblem, is not consistent, however, and in some cases outside of the quarry it appears to depict other objects. Cristián Arévalo Pakarati, co-director of EISP, has spent hundreds of hours on site over the past months painstakingly measuring and drawing these designs as he supervises the site during our seasonal hiatus from on-going excavations. We hope you continue to follow our progress over the next few years on this web site. Although we are partially funded by a generous grant from the Archaeological Institute of America, we need your help. Please join Friends of EISP. Through that association you will meet and learn from a growing group of informed and caring people. Click on support to become a member of our team as we work to conserve the stone giants of Rapa Nui.